I haven't actually been to Ethiopia but after spending a week practicing making Injera with my husband Martin (who made it his sole mission to conquer this bread) and then spending an entire day cooking up an Ethiopian menu of Doro Wat, Injera and Eggplant and Tomato Salad I feel a little closer to this African nation. After shopping for the ingredients for this feast, many being obscure spices located with the wonders of the internet, I was certainly curious to find out a little more about Ethiopia. What struck me was that we were spending a fortune on ingredients to essentially make two dishes, we came out at around $120 all up. It dawned on me I had spent a large portion of the average Ethiopian income on one single meal. Of course I know you can't compare our economies and our wages are in line with the cost of food here in Australia and when we earn so much more we will pay so much more for food, but that then led me to question what the realities are of living in Ethiopia? From cooking this one simple meal I was lead down the yellow brick road of curiosity. I am relying on the internet for these facts and figures and whilst I attempted to find reputable sources don't blame me if these are wildly inaccurate. So Ethiopia is a country of 90 million people on a land mass not much bigger than my birth state of South Australia, which has a population of 1.2 million people. It has a median monthly income of $284 US dollars is around 1/12th my monthly income. You might then guess food must be really cheap, but according to this website chicken breasts cost $8.35 a kilo and a dozen eggs $1.76. You can currently buy a kilo of chicken at my local Coles Supermarket for $9.98 a kilo and a dozen eggs for $2.90. You can see where I am going here and the disparities are mounting. I would also assume that a lot of Ethiopians raise their own chickens and grow some of their own vegetables but you can't deny it must be tough especially with the nations propensity for drought. Subsistence farming in Ethiopia in borne from necessity and not a trend or hobby like here in Australia. 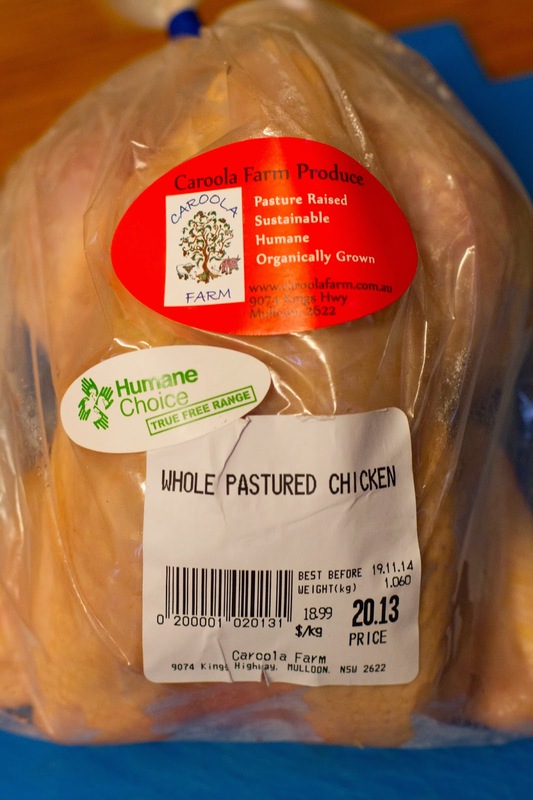 I also concluded that when I can purchase chicken for $9.98 a kilo that my choice of locally reared, organically raised, pastured chicken at $18.99 a kilo was a dickhead move and made me feel dirty in my choices as a wealthy Australian (wealthy, on global standards not Australian). I guess supporting sustainable and animal friendly farming practices is noble but if I had bought the cheap chicken and made more wise purchases like this I could afford to feed an Ethiopian family with the remaining funds. And if all western cultures were wiser with their purchases and denied the monster that is consumerism more often maybe poverty would not exist. That's the thing about Western culture though. We have enough money to revel in our choices and selfishly give little thought on how we can help the wider global community. Wow that all got very serious there for a moment. Back to the food. Doro Wat is a heavily spiced chicken stew. You can see the recipe we used here. It was not difficult to make but was reasonably time consuming when also breaking down and skinning your own chicken, making Injera from scratch and also cooking this side salad which involves roasting eggplants and zucchinis. All up it took the two of us around 5 hours to make it all. The Injera was probably the trickiest to master. There are any number of recipes and tips on the internet, it was a little overwhelming. We experimented with a sourdough method all week. It is also difficult to get traditional Teff flour is Australia so we opted for a mix of white and wholemeal flour. 1 1/2 cups of plain flour, 1/2 cup Atta (wholemeal flour) half a sachet of yeast and enough water to make a runny consistency. We left it overnight and would adjust the consistency with water when using it. We found it was not creating enough of the bubbling texture so we cheated and use baking powder to do this. We also found a low/mid heat worked best. You will need to play around to get the right thickness and size, this isn't something you will get right the first time. We then kept the leftovers of the sourdough mixture each day, added more flour and water after each use so by the time we were cooking the actual meal the sourdough was aged around 4 days. It did get more sour each day as the yeast continued to develop and that helped with the authentic taste of it. The Doro Wat itself was fascinating and foreign all at the same time. There was one point during the cooking process that we thought we would end up at a local restaurant for dinner. The quantity of spices in this thing is astounding and with the spices being so foreign we were unsure it was going to be palatable. I made the mistake of tasting it not long after the bulk of spices went in and with the spices being raw it was not a good experience. But as the spices cooked down they developed a far sweeter taste and by the time it was ready it was quite delicious. The stew also had a dozen eggs in it which of course I poo poo'd the $2.90 a dozen option for the $5.60 a dozen local free range variety but in this case the extra money does get you a far superior product. There is one final conclusion from making this meal. 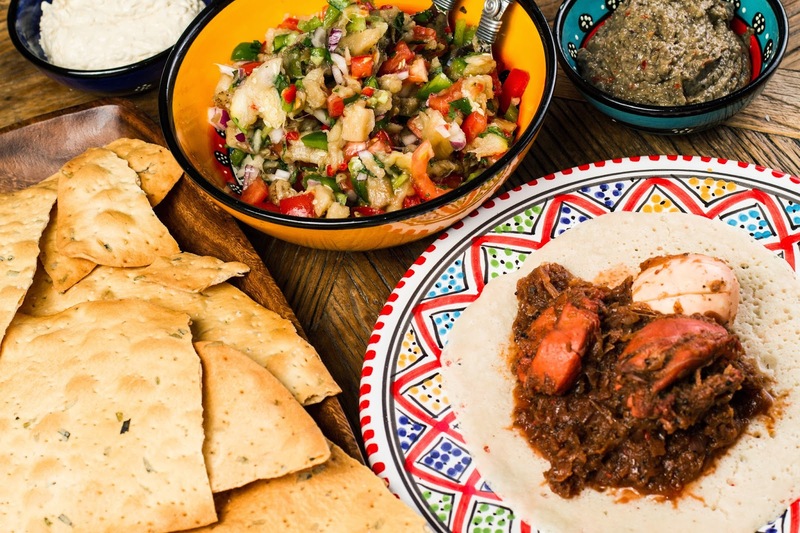 A feast is best when shared and having invited over family to enjoy in this traditional Ethiopian feast the meal was elevated into a real experience that will be slotted away in the memory bank under "good times".